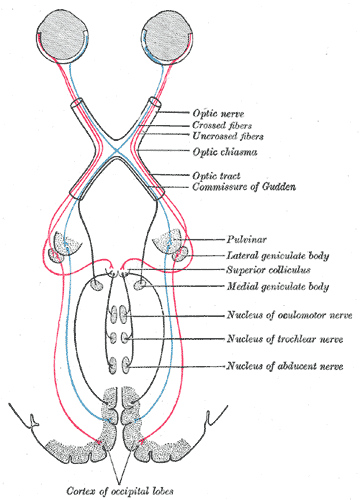 The origin of the Tectospinal tract is in the superior colliculus of the midbrain. As this area recieves information regarding visual input, this tract is primarily responsible for mediating reflex responses to visual stimuli. The tectospinal tract is named after the tectum, meaning roof. The tectum can be interpreted as the 'roof' of the fourth ventrical. The fourth ventricle is made up of the superior and inferior colliculi. - Superior colliculus of the midbrain (tectum of the midbrain). - The Tectospinal tract receives information from the retina and cortical visual association areas . In response to visual stimuli, the tectospinal tract mediates reflex movements.It is able to orientate the head/trunk towards auditory stimulus (inferior colliculus) or visual stimuli (superior colliculus). - Efferent fibres are thereby also sent to the reticular formation that trigger saccades and also spinal regions innervating the neck The connections with effector muscles are excitatory to contralateral neck muscle motor neurons and inhibitory to ipsilateral motor neurones. Pitfalls in the diagnosis of pupil-sparing oculomotor nerve palsy without limb ataxia: A case report of a variant of Claude's syndrome and neuroanatomical analysis using diffusion-tensor imaging. ↑ 2.0 2.1 2.2 Carpenter R, Reddi B. Neurophysiology. A conceptual Approach. Fifth Edition. Hodder Arnold:London, 2012. ↑ 4.0 4.1 Rea P. Essential clinical anatomy of the nervous system. Academic Press; 2015 Jan 5.